1.Reform of the MBTA has taken its seat in the legislature’s lap, and the prospects do not look good that the recommendations in Governor Baker’s Panel will survive the politics. The T’s uions have made it clear they will accept no change whatsoever in their contractual privilege, their work rules, or their financial operation. The House will almost certainly approve the panel’s administrative reforms and its financing suggestions, but the state senate has a different agenda from the rest of Beacon Hill and probably will not. We will have MBTA reform. the public insists. But it will probably have to be done by the Governor acting unilaterally : receivership. 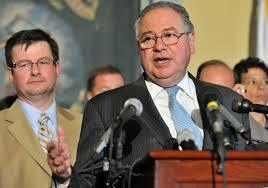 2.Speaker Robert DeLeo has moved powerfully to assert the House’s primacy in the legis lature. He refuses to accept Senate President Stan Rosenberg’s moves to win equal power for his branch of the legislature, and he seems to have almost unanimous support from his members, even the GOP and the Progressives. The sentiment I hear from House memers of all sorts is that they are proud of the Speaker for asserting the House’s primacy so forcefully. Proof that this isn’t just lip service comes by way of the several unanimous votes the house has given to budget bills that in prior years would have been quite divisive. Who could have imagied that the House would unanimously — even the progressive members from Cambridge, Brookline, and Somerville — adopt Governor Baker’s $ 38.1 billion FY 2016 udget, complete with cuts ? Sooner or later Seate President Rosenberg is going to have to face that Governor Baker and Speaker DeLeo have forged a striking unity of policy objectives and that he will look the obstructionist if he doesn’t accede to that pact. Meanwhile, Baker and DeLeo are demonstrating what I have been saying for the past 15 months : Massachusetts works best when the Democratic Speaker and non-Democratic Governor agree upon a course of action. 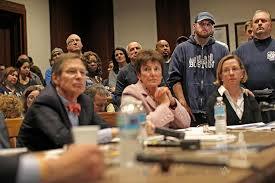 3.The committee pursuing the Boston 2024 Olympics bid has shake itself up enormously and risen from disaster. A month ago “Boston 2024” looked like the Deval Patrick administration in exile, a political rescue farm rather than a huge civic enterprise. No loger. Boston 2024 has added a galaxy of sports stars to its board; those sports figures now lead the discussion. Did it really take John Fish and his team this long to figure out that a sports event should be spokespersoned by sports people ? I guess it did. meawhile, the opponents of Boston 2024 keep on keeping their objection mode. Having been trumped on the spokespeople front, they’re now pointing to siting miscues — the MBTA repair yards and several real estate developments in Columbia Point cannot be used, and the proposal to use them looks like very poor planning. But of course, what looks like poor planning is simply a proposal that needs adjustment, as happens in all major projects. Miracle men might get such a immense project right the first time on every detail, but human beings aren’t miracle men. So ? Adjust the plan, Problem solved. But not for the No crowd. They’re even bringing back their first argument, that Boston 2024 will lose money leading to taxpayer bailouts. This despite the Committee’s readiness to finance the etire project other tha permanent infrastructure improvements. One gets the impression that the No people want the Olynpics to fail. they really do sound like party poopers. The new oston coming into being dioes not eed — cannot use — party poopers. It needs bold optimists and happy risk takers. The Olympics committee seems ready now to forge ahead quickly. $ 1 billion expansion, which depends for its financing on state bonds. The halt also stops some very big construction projects in the Seaport district. I understand the Governor’s view that taxpayer money should not finance private investment, but stopping the dynamism — the momentum — of the Boston building boom doesn’t strike me as a happy consequence of his decision. We need more building momentum, not less. 5.The Governor has begun aggressively to replace the members of almost every State administrative board with people of his choosing. All governors do this, but Baker is doing it across the board and quickly now, even as he initiates admiistrative review of all state regulations. This sort of momentum I fiully approve. Baker needs to make it clear that it’s his call now, his agenda, his way of doing things, his expectation that the taxpayer will get a full dollar of effective government for every tax dollar spent. We deserve nothing less. 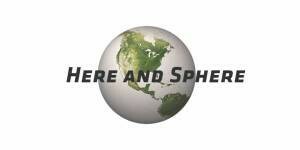 To give less is to disrespect everybody, the taxpayer and the person being served by tax dollars. In his campaign last year, Governor Baker said he’d compete for 100 percent of the vote. By his across-the-board, top to bottom reforms, he is doing exactly that.